Lockheed were aware that USAF experience in Korea had shown the need for an air-superiority fighter able to operate from forward airfields and climb rapidly from the ground to engage in high-level combat. The Model 83 was designed to fulfil these roles, and in formulating his design "Kelly" Johnson attempted to keep it as cheap, small and readily maintainable as possible. Tendered to the USAF as an unsolicited proposal, it was necessary for competitive bids to be received and the USAF notified a formal requirement for such an aircraft in late 1952. Submissions were received from North American and Republic; but as both of these companies were already heavily involved in fighter development and production, Lockheed's proposal was selected cautiously: two XF-104 prototypes being ordered for development and testing. The long fuselage was tailored round the J79 engine, and the flying surfaces were small, unswept and very thin. A token monoplane wing mid-set on the fuselage - this latter assembly wrapped tightly round a powerful turbojet engine - needle-nosed and T-tailed. 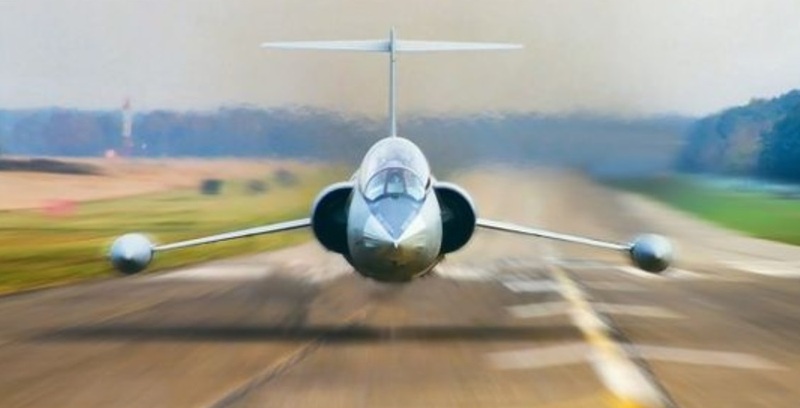 Able to demonstrate a level speed of around 2,250km/h and to climb to a height of 25km in about 4.5 minutes, the Press dubbed the Starfighter the "missile with a man in it". The XF-104 had a narrower and shorter rear fuselage compared to the production models. The first of these flew on 28 February 1954, followed by test and evaluation aircraft. It was not until 26 January 1958 that the first production F-104A began to enter service - as interceptors - with Air Defense Command's 83rd Fighter Interceptor Squadron. The US Air Force had already lost interest in the type and took only 296 Starfighters. F-104A (170) and multi-mission F-104G (77) served with the USAF, as well as F-104B (26) and F-104D (21) two-seat operational-trainer counterparts of the A and C respectively. The type was then saved by the creation of the F-104G multi-role version for production by a multi-national European consortium as well as for Japan. Post-war Mitsibishi built Lockheed F-104J Starfighters with Kawasaki. Winner of a previous so-called 'sale of the century' and used by several NATO air arms for many years. During its heyday the Starfighter formed the backbone of the NATO alliance's air power and a number of reconnaissance-configured aircraft were produced, sensor packages varying considerably according to the specialized requirements of the parent air arm. Deliveries of 30 F-104F trainers to the Luftwaffe began in mid-1960. The most widespread variant was the RF-104G, which featured a belly fairing containing cameras, installation of these necessitating the removal of the M61 Vulcan rotary cannon armament. 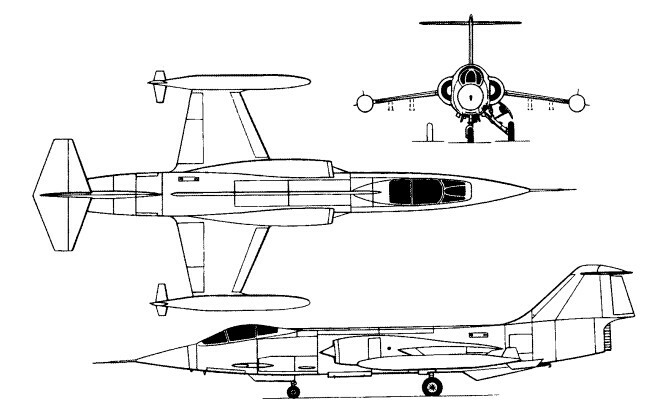 West Germany, Italy and the Netherlands all operated this variant of the Starfighter for a time, although the Netherlands used the standard F-104G for reconnaissance tasks, using the Orpheus pod to accomplish this mission. The German Luftwaffe and Marineflieger used the RTF-104G two-seater. Following development by Lockheed of the multi-mission F-104G, more than 1,000 came from production lines in Belgium, Germany, Holland and Italy to equip the air forces of those nations. Similar versions were built under licence in Canada and Japan. Lockheed also built 179 F-104G for export or for supply to friendly nations through the Military Assistance Program. These were essentially similar in appearance to their European counterparts and were fitted with three Hycon KS-67A cameras, examples being delivered to Norway and Taiwan, most of the Norwegian specimens being passed on to Turkey. The Canadian built CF-104 Starfighter was one of the most successful jet fighter aircraft to serve with Canada's Air Force. A total of 340 fighters were built under license by the Canadian government. The CF-104 was designed as a light-weight nuclear strike aircraft. The aircraft were retired from service in 1986 after being used for over 25 years until they were was replaced by the CF-18. Canada's CF-104 (Canadian-built F-104G) was also originally engaged in reconnaissance duty, aircraft assigned to this task being fitted with a prominent belly-mounted pod containing a battery of Vinten cameras. 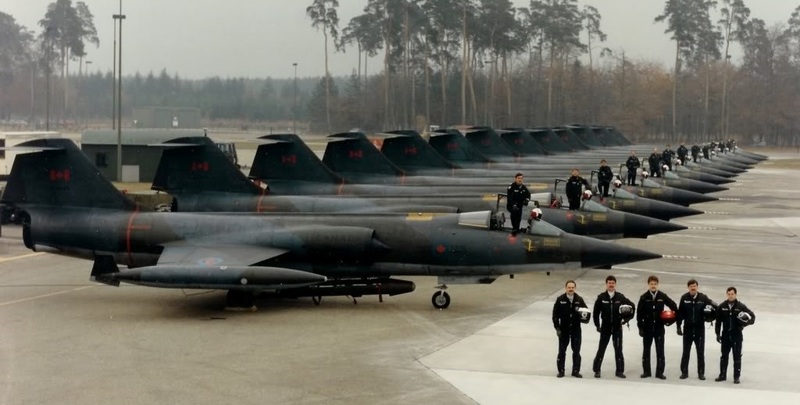 Thirty-nine CF-104D models built by Lockheed were purchased by the Canadian Air Force for training. The CF-104 (single seat version) was built in Canada under license by Canadair in Cartierville, Quebec. The first aircraft produced by Canadair flew in May 1961, with 200 single seaters (CF-104) being produced for the RCAF. 22 Lockheed-built two seaters (CF-104D) were also used by the RCAF. The aircraft in later years provided a measure of unparalleled stability in the low-level, high speed environment until phased out in 1986. The majority of the Starfighters were transferred to the Turkish Air Force. After the RCAF production order was filled in June 1963, Canadair produced another 140 aircraft for other countries. Production ended in America, but in 1966 the first prototype of the Aeritalia-built F-104S flew for the first time. The Italian Air Force is receiving a total of 205 aircraft, and Turkey received 40 from 1974. Power is provided by one 17,900 lb thrust (with afterburning) General Electric J79-GE-19 turbojet engine. Armament in an air-to-air role consists of two Sparrow and two or four Sidewinder missiles, plus the 20 mm M-61 multi-barrel cannon. In an attack role bombs, rockets, and other weapons up to a weight of 7,500 lb (3400 kg) can be carried on nine wing and fuselage stations. Total Starfighter production was 2,282 units. A Starfighter, built from non-serviceable ex-military aircraft components by American Darryl Greenmayer over a ten-year period, was the fastest and most complex "homebuilt" aircraft ever completed. With this aircraft, prepared by American Jet Industries in California and known as the Red Baron RB-104 Starfighter, he raised the world speed record over a 3km low-level course to 988.26 mph / 1,590.45 kph on 24 October 1977 at Tonopah, Nevada. The RB-104 was lost in an accident in 1978. For training in the aerospace field, three early Starfighters have been modified to NF-104A standard by the addition of a 6,000 lb thrust (2722 kgp) Rocketdyne booster and reaction-jet controls for exploration missions up to heights of nearly twenty-five miles. Armament: 1 x six-barrel M-21 20mm Vulcan cannon & 2 x Sidewinder AAMs. Engine: 1x 15,800-lb (7,167-kg) reheated thrust General Electric J79-GE-llA turbojet. Maximum take-off weight 28,779 lb (13,054 kg). Wing area 196.1 sq ft (18.22 sq.m). Armament: one 20-mm multi-barrel cannon and up to 4,310 lb (1,955 kg) of disposable stores. Engine: one General Electric J79GE- 1 IA turbojet, 7167-kg (15, 800-1b) afterburning thrust. Maximum take-off: 11352 kg (25, 027 lb). Wing area 18.22 sq.m (196.1 sq ft). Wing span: 21 ft 11 in (6.68 m).